Michael Dooney provides the cover for the first volume of ‘missing’ issues in IDW’s reprinting of the first Mirage series. This is a collection of TMNT short stories together with issue 13 of Mirage’s original run, which wasn’t included in the recent ‘Ultimate’ hardback collections owing to it being non-Eastman and Laird written and drawn. The short stories are selected missives from ‘Shell Shock’, an amazing trade paperback collection originally published in December 1989. 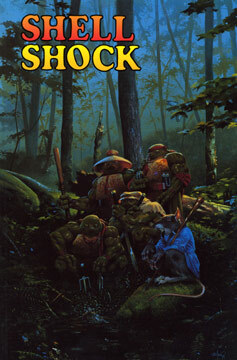 Shell Shock holds a particularly fond place in my heart as it enabled me, through lending it to friends at the tender age of 10, to spread the word of the TMNT’s ‘dark’ roots and comics generally (this and ‘Death in the Family’ both were passed on and back) – the downside to this, which gave me an aversion to lending anything else out ever, was that a few panels in random stories came back coloured in (badly), the cover got all mashed up and the spine creased. But I digress. What I mean to say is, these are stories close to my heart and I know the originals inside out. Seeing them coloured was jarring on first look, but I gradually warmed to the majority of the Eastman and Laird ones. However… seeing Michael Zulli’s dreamlike narratives coloured in this way seems pretty wrong. The covers to his ‘Soul’s Winter’ trilogy themselves were painted, adding to the reverence of his pencils and washes. Seeing his work coloured digitally in O-Deed and A Splinter In The Eye Of God? leaves me wanting – leaving these b&w or painting rather than colouring digitally would have kept them beautiful. The only other major gripe I have here is a little, tiny bit of colouring retconning that actually digusted me. Harsh, I know. Michael Dooney’s Junkman Donatello on a solo adventure – with purple knee pads. Red bandana, check. But purple knee and arm pads? And to rub salt in the wounds, Leo and Mike appear to have colour coded joint protection in the last couple of panels. Did Eastman approve this? Or did an over-zealous young member of the Digikore Studios colouring collective (for they are legion) try to make the Turtles ‘easy to distinguish’ for one story only? The other stories seems to follow the standard red bandana – brown pads formula we know and love. I suppose it could have been worse, had the bandanas been retconnned too. Don’t get me wrong at all, I totally (turtley?) 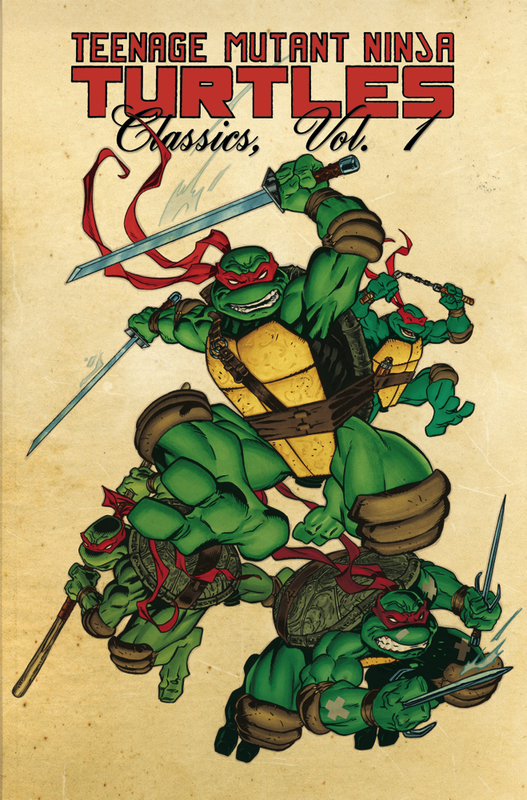 love IDW’s dedication to exposing the roots of the TMNT to new fans – and their multi-pronged attack in achieving this goal is much appreciated. And frankly, the Ultimate Collections make up for the purple knee pads.